The underlying causes of conjunctivitis are variable but bacterial bacterial conjunctivitis is developed due to some kind of infection caused by some kind of staphylococcus aureus, streptococcus pneumoniae or hemophilus influenzae etc. Chlamydial conjunctivitis is one of the most commonly occurring type of bacterial conjunctivitis to healthy individuals. Acute chlamydial conjunctivitis is a kind of bacterial conjunctivitis that is developed due to infection caused by micro-organism termed as chlamydia trachomatis. chlamydia trachomatis is well known for spreading sexually transmitted disease (STD). The acute eye disorder is also called as chlamydial inclusion Conjunctivitis in healthy individuals. Regularly wash eye with some antiseptic solution like boric acid or normal saline. Rinse eyes with ice cold water to reduce the inflammation caused by chlaymdia trachomatis. Instill drops of some broad spectrum antibiotic like chramphenicol along with steroids like dexamethasone. Avoid eyes from heat exposure because it will increase irritation and swelling. Repeat the above mentioned procedure for 5-6 days to eradicate infection completely. Gonorrheal conjunctivitis is one of the most severe of the infections that involve the eyes, and it can be the most tragic. It is caused by the same germ that causes venereal gonorrhea. The germ is carried to the eyes by fingers or towels that have been contaminated by contact with some of the discharge from a gonorrheal infection. It can also be acquired by a newborn babe at the time of birth from direct contact with the genital tissues of an infected mother. Without prompt and adequate treatment, gonorrheal conjunctivitis frequently causes blindness by destruction of the tissues of the eye. The first symptoms appear from twelve hours to three days after the germs contact the membranes of the eye. 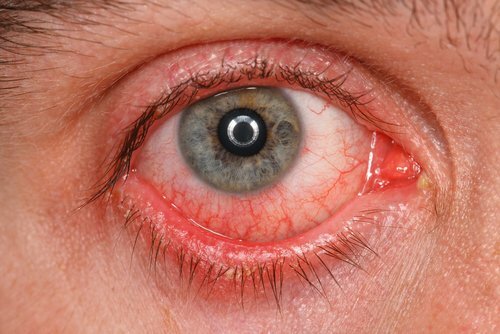 There is extreme redness, swelling, and tenseness of the eyelids. A profuse discharge comes from between the eyelids, which is at first watery and bloody and soon becomes laden with pus. The eye burns and smarts and feels painful. It is tender to touch. From the very first, extreme care must be taken to prevent the infection from being carried to the other eye (if only one eye is infected) or to some other person.Anyone caring for the patient should wear a surgical gown, face mask, rubber gloves, and protective glasses while with the patient. All materials used in treating the patient, such as towels and compresses, should be placed at once in a disinfectant solution before being destroyed or laundered. Such a solution can be prepared by dissolving one teaspoonful of lysol in two quarts (two liters) of water. Gonorrheal conjunctivitis may spread to other organs in case of poor hygiene. Long persistance of gonorrheal conjunctivitis may lead to corneal ulcer or damages deep tissues of eyes. Pus like fluid may produce may produce in some cases. Early intervention may decrease the severity and limit further damages. 1. The patient should be placed under the care of a doctor as soon as possible. Preferably, the patient should be treated in a hospital. Methods of treatment now available provide very good prospects of recovery with preservation of normal eyesight provided they are employed early in the course of the disease. Antibiotic and steroidal therapy administered usually to control the infection promptly. 2. Cold compresses (wrung from ice water) applied to the eyes help to reduce the swelling and congestion of the eyelids and make the patient more comfortable. These can be used continuously at first and then intermittently as inflammation subsides.